Supporters of Temporary Protected Status immigrants hold signs and cheer at a rally. Court documents released this week reveal efforts by DHS to justify ending TPS for immigrants in certain countries by showing their home countries were safe, even when other officials disagreed. The American Civil Liberties Union sued the Trump administration in an attempt to restore protected status to immigrants from Sudan, Nicaragua, Haiti, and El Salvador. Thousands from those four countries were given safe haven in the U.S. following crippling natural disasters and civil conflict, but earlier this year the Trump administration officially ended their protected status. As part of the case, which has a key hearing in front of a judge in San Francisco next month, lawyers for the ACLU and the National Day Laborer Organizing Network convinced the court to order the federal government to disclose communication between DHS officials and other federal agencies, including with officials at the Pentagon and the State Department. The messages reveal that DHS asked staffers to find "positive gems" about war-torn countries to justify sending more than 300,000 people back to their homelands. The internal back-and-forths also demonstrate more subtle ways DHS sought to downplay the severity of conditions in volatile countries, like using the word "challenges," instead of "disasters" in talking points to the public. That guidance raised alarms with seasoned State Department officials. For instance, DHS officials wrote that their review of the conflict in Sudan demonstrated that conditions have "sufficiently improved," and that the country, "no longer meets the statutory conditions for designation," since the armed conflict had dissipated. The problem with that conclusion? It is not accurate, according to an email career foreign service officer for Sudan Paul Sutphin wrote to DHS. He additionally worried that such a soft assessment of dire conditions could imperil Sudanese who have fled violence. "It is likely that the Sudanese government could view the current language and inaccuracies," Sutphin wrote, "as a green light" from the United States government "to force the return of internally displaced" people "to deadly conflict-affected areas." Other State Department officials wrote to DHS saying they were caught flat-footed by the demise of a program that has provided legal shelter in the U.S. to hundreds of thousands of people, some having been protected by the status for decades. "We literally were forced to dispatch our Foreign Affairs Officers by taxi to the embassies with virtually no notice to inform the host governments of the imminent announcement," wrote Chris Ashe, a top State Department official, to DHS leadership. To ACLU lawyer Ahilan Arulanantham, who is representing five TPS recipients in the suit against the Trump administration, the emails show that DHS is more concerned with carrying out Trump's hardline stance on immigration than it is with following the law. "They cut diplomats out of the decision-making process. They rewrote their reports, downplayed sometimes really horrific problems in countries and basically did everything they could to justify the result that the Trump administration wanted," Arulanantham said in an interview. Those policy goals, in Arulanantham's view, are not just unconstitutional, which is what his suit claims, but also "motivated by racist, white supremacist agenda," since, Trump's goal is to "expel as many immigrants as possible" at any cost, he said. Despite the concerns raised by diplomats and other State Department officials about the justifications DHS was laying out, the Trump administration moved forward with ending the humanitarian program for countries federal officials said no longer deserve the protection. On Friday, DHS officials told NPR they are standing by the decision. "As intended by Congress, TPS was always meant to be a temporary mechanism to address urgent humanitarian conditions," said Katie Waldman, a spokeswoman for DHS. "For countries where an extension is justified under the law, DHS has issued appropriate extensions to assist those affected by the conditions prescribed in statute." People who have protection under TPS have to renew their permits every 18 months. As such, recipients from countries from which Trump has rescinded the protection have a 18 months to leave the country or face deportation proceedings. That said, the ACLU and immigration advocates are hoping that the pending legal challenge will force a policy shift before thousands have to leave the U.S.
A Sept. 25 hearing has been set in federal court in San Francisco in which ACLU lawyers and the federal government are expected to deliver arguments over whether TPS was ended legally. If not, a judge could order the Trump administration to reinstate the protections. "The law is if the conditions in the country remain unsafe or unstable then you should extend the temporary protected status," Arulanantham said. "This administration has broken the law." 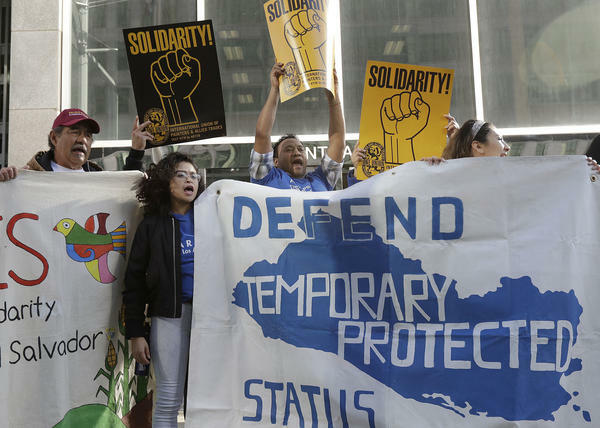 Now the latest chapter in the Trump administration's defense of ending temporary protected status, or TPS, for hundreds of thousands of people living in the U.S. Newly released internal emails show the Department of Homeland Security trying to prove that war-torn countries were getting safer when that was not true. NPR's Bobby Allyn has this report. BOBBY ALLYN, BYLINE: DHS was planning on announcing the end of temporary protected status for people living in the U.S. from Sudan, Nicaragua, Haiti and El Salvador. But before it was made official, emails revealed and newly released court documents show DHS asked staffers to find positive gems about those countries ravaged by war and natural disasters. And that word, disasters - DHS officials wanted it scratched so it wouldn't look like they were sending people back home into harm's way. Career diplomats in the State Department fought back. That tension between Trump Homeland Security officials and veteran diplomats is laid bare in the emails a court made public this week. Ahilan Arulanantham with the ACLU of Southern California pushed for their release. AHILAN ARULANANTHAM: They rewrote their reports, downplayed sometimes really horrific problems in countries and basically did everything that they could to justify the result that the Trump administration wanted. ALLYN: He's on the legal team that's suing the Trump administration to force the government to reinstate TPS for more than 300,000 people. In one email exchange found in the documents, DHS wrote that the armed conflict in Sudan had sufficiently improved enough that the Sudanese no longer needed a safe haven. The problem with that conclusion - it wasn't true. A career foreign service officer replied in an email by highlighting a bloody, insurgent-led military offensive in Darfur just months before as proof. ARULANANTHAM: This is an administration which has bent and, in this case, clearly broken the law in order to expel as many immigrants as possible. ALLYN: A spokesman for DHS said federal officials aren't breaking the law by ending the special status, which, after all, has temporary in its name. Next month, the Trump administration will be going to federal court to prove that how they ended TPS was legal. If they can't, a judge could reinstate the protections. Bobby Allyn, NPR News.